It is quite normal to experience different kinds of aches and pains as a runner. These problems are expected and can, therefore, be easily addressed. One sensation you may face that may scare you is when your feet go numb or ‘fall asleep' when you run. When this happens, you need to identify the cause for the numbness as soon as possible so you can get back to your running routine. The question is: Why do my feet go numb when I run? We'll answer this question in the article. We will also provide you some easy tips to remedy and prevent the numbness. Why do My Feet Go Numb when I Run ? The sensation of foot numbness closely resembles what is often referred to as “pins and needles”. It feels like you have been sitting on your foot for extended periods of time causing restricted blood flow and resulting in numbness.If it happens when you are running, there is obviously a deeper cause for the numbness. Many experience either a numbness in a particular area of the foot or in other cases, your entire foot may turn numb. The following are five of the main possible reasons why your foot is numb when you run. The sciatic nerve is the nerve that starts from the lower part of your spine and ends in your foot. It plays an important role in connecting the leg to the foot muscles through the spinal cord. If you experience a numbing sensation in the base of the foot, it may be a result of compression of the sciatic nerve. One of the common causes for foot numbness is getting back to your running routine too fast after having a foot injury. After enjoying a fixed running routine and then having to lay low for a while because of injury, it is easy to underestimate your recovery. Getting back to your running routine too fast can cause the tissue in the foot to swell and lead to numbness. It is also good to remember that some injuries may be totally unrelated to the foot but still cause numbness. For example, a slipped disc in your back can cause the numb feeling. Wearing shoes that are too tight may hinder proper circulation of blood in the body causing foot numbness. Constantly putting your feet in tight shoes may, in the long run, cause the nerves to compress. This may be the cause of your numbness if you also experience other signs that you have ill-fitting shoes. You experience inflamed tendons especially on the inside of the ankle or the outer part of the foot. This is caused when the arch of the shoe doesn’t provide enough support. If you discern that this is the cause of your foot numbness, the easiest solution is to get proper fitting shoes. You may need to consult a professional to make sure. Some people who have flat feet experience foot numbness because of their condition. This is because the nerves may easily be compressed when the feet are flat. According to statistics, about 20% of the population in the UK suffer from some sort of flat feet. If you experience any of the mentioned symptoms and have not officially checked whether you have flat feet, this may be the time to consult a physician. This is a more serious cause for numbness in your feet that has nothing to do with any nerve damage or foot condition. Some diseases such as diabetes can affect the function of the nerve system. Because of the increase in blood sugar, blood flow to the nerves is affected causing damage. The condition is referred to as diabetic neuropathies. If you have been suffering from diabetes for some time, you may experience numbness or a tingling feeling in your hands, feet and other parts of the body. This may be caused by a number of factors including injury of the nerves, damaged blood vessels, lifestyle factors, and heredity. In addition to diabetes, other diseases such as vitamin B or folate deficiency and thyroid disease may trigger the numbness in your feet. Some medications may also have numbness as a side effect. If you feel that these symptoms are true in your case, consult a physical immediately and take appropriate measures. The sensation of numb feet when you run is not as unique as you may think. As we have learned, the condition may be caused by five main factors. First, your sciatic nerves may be compressed leading to restricted blood flow and consequent numbness. Second, you may be experiencing foot trauma because you went back to running too soon after injury and your nerves haven't fully recovered. Third, your shoes may be too tight causing restricted blood flow and the tingling sensation. Fourth, your foot structure may be the cause especially if you are flat footed. Lastly, the numbness may be a result of a disease such as diabetes. Once you identify the possible cause for your numbness when you run, take decisive steps to correct the issue. Remember that the faster you identify and correct your condition, the lower the chances of your condition from worsening. How did you like our article? Which possible cause for numb feet did you find most interesting? 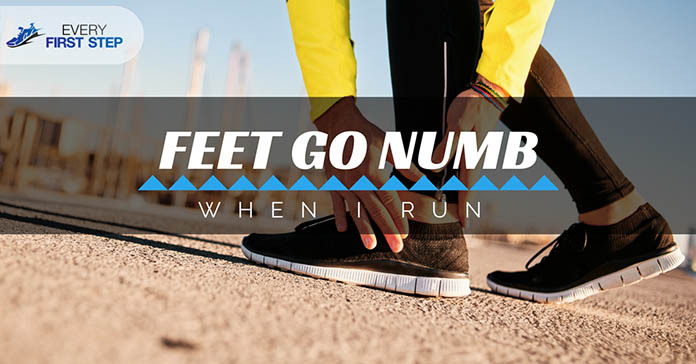 Have you experienced numbness in your feet when you run in the past? What did you do about it? We'd love to hear about your experiences in the comments below. Feel free to share this with your family and friends too.